previous coats must dry and free of contaminants. Steel – Abrasive blast to SSPC SP-6 or higher with a 1.0-3.0 mil surface profile. Higher surface profiles up to 5 mils are acceptable, but the product must be applied in a thickness great enough to achieve a minimum of 2.5 mils dry film thickness. 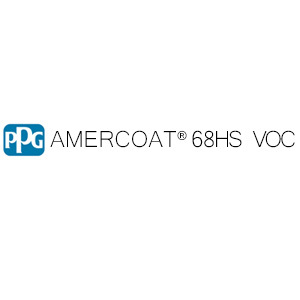 Apply Amercoat 68HSVOC as soon as possible to prevent the blasted surface from rusting. Keep moisture, oil, grease, or other organic matter off surface before coating. For touch up and repair, power tool cleaning in accordance with SSPC SP-11 is acceptable. Surface temperature must be at least 5°F above the dew point temperature. General air quality – Area should be sheltered from airborne particulates and pollutants. Ensure good ventilation during application and curing. Provide shelter to prevent wind from affecting spray patterns. Mixing – Only mix full kits. Air spray – Thin up to 10%, standard conventional equipment, 0.070″ fluid orifice. A moisture and oil trap in the main line is recommended. Separate regulators for air and fluid pressure are recommended. This is a solvent borne paint and care should be taken to avoid inhalation of spray mist or vapor as well as contact between the wet paint and exposed skin or eyes. * With force cure capabilities (oven temperatures of 140-180°F), product can be overcoated after 5-15 minutes. Allow 5-10 minutes flash off prior to heating past 120°F. Addition of Amercoat 861 accelerator is recommended for this procedure. * Surface must be power washed as needed to remove all surface contaminants including zinc salts. Surface must be clean and dry. Worldwide statement – While it is always the aim of PPG Protective & Marine Coatings to supply the same product on a worldwide basis, slight modification of the product is sometimes necessary to comply with local or national rules/circumstances. Under these circumstances an alternative product data sheet is used. PPG warrants (i) its title to the products, (ii) that the quality of the product(s) conform to PPG’s specifications for such products in effect at the time of manufacture and (iii) that the products shall be delivered free of the rightful claim of any third person for infringement of any U.S. patent covering the products. THESE ARE THE ONLY WARRANTIES PPG MAKES AND ALL OTHER EXPRESS OR IMPLIED WARRANTIES, UNDER STATUTE OR ARISING OTHERWISE IN LAW, FROM A COURSE OF DEALING OR USAGE OF TRADE, INCLUDING WITHOUT LIMITATION, ANY OTHER WARRANTY OF FITNESS FOR A PARTICULAR PURPOSE OR USE, ARE DISCLAIMED BY PPG. only. PPG may modify the information contained herein at any time as a result of practical experience and continuous product development. All recommendations or suggestions relating to the use of PPG products, whether in technical documentation, or in response to a specific inquiry, or otherwise, are based on data, which to the best of PPG’s knowledge, are reliable. The products and information are designed for users having the requisite knowledge and industrial skills and it is the end-user’s responsibility to determine the suitability of the product for its intended use. PPG has no control over either the quality or condition of the substrate, or the many factors affecting the use and application of the product. Therefore, PPG does not accept any liability arising from loss, injury or damage resulting from such use or the contents of this data sheet (unless there are written agreements stating otherwise). This data sheet supersedes all previous versions and it is the user’s responsibility to ensure that this data sheet is current prior to using the product. The English text of this document shall prevail over any translation thereof. The information in this data sheet is based upon laboratory tests we believe to be accurate and is intended for guidance only. All recommendations or suggestions relating to the use of the products made by PPG Protective & Marine Coatings, whether in technical documentation, or in response to a specific enquiry, or otherwise, are based on data which to the best of our knowledge are reliable. The products and information are designed for users having the requisite knowledge and industrial skills and it is the end-user’s responsibility to determine the suitability of the product for its intended use. PPG Protective & Marine Coatings has no control over either the quality or condition of the substrate, or the many factors affecting the use and application of the product. PPG Protective & Marine Coatings does therefore not accept any liability arising from loss, injury or damage resulting from such use or the contents of this data sheet (unless there are written stating otherwise). The data contained herein are liable to modification as a result of practical experience and continuous product development. This data sheet replaces and annuls all previous issues and it is therefore the user’s responsibility to ensure that this sheet is current prior to using the product. The current data sheets are maintained at www.ppgpmc.com The English text of this document shall prevail over any translation thereof.